for a circumnavigation class catamaran. Antipodes is the only pre-owned Antares on the market with Selden’s powered in-mast furling mainsail. By definition, Antipodes is the direct opposite of something and is typically a geographical reference. Wikipedia explains it best (of course) by stating "A pair of points antipodal to each other are situated such that a straight line connecting the two would pass through Earth's center. Such points are as far away from each other as possible, a great-circle distance of 10,800 nautical miles." This name is quite fitting for a catamaran that is fully equipped for circumnavigation and is best suited for globe girdling (as opposed to taking a direct course through the center of the earth!). Antipodes left the Argentine factory in early 2015 and anchored in a small harbor in Brazil's Costa Verde, about 1200NM from Buenos Aires. After such a great leap, the short sailing distances between destinations were a welcome reprieve. The whole region spanning the coast of the state of Rio de Janeiro is an ideal cruising ground. Antipodes owners Charles and Leslie spent a season exploring the many secluded anchorages with pristine beaches and protected harbors. When not cruising, Antipodes was under the guardianship of the harbor master and, from polishing to operating all systems, was well cared for in the absence of her owners. The decision to install Selden's powered in-mast furling system was an easy one to make for the owners. First, there is the convenience of in-mast furling which added enjoyment with a reduced amount of work and effort. Also, the powered furling not only offered easier reefing, but the choice of reefing points is infinite. Instead of having one or two rigged options of what might constitute a reef, the possibilities are endless. And there was never a compromise when it came to performance. Reports from the field have demonstrated impressive numbers. One owner reported sailing extensively on a broad reach, with the Genoa and main, and maintaining 12 knots for over 6 hours in 25 knots. And that's fully loaded for full time liveaboards. On arrival to North America, Antipodes had NEW Volvo engines installed (part of a Volvo recall) that come with a full warranty. From two chart plotters to a watermaker, solar panels, SSB radio, KVH Tracphone and more, Antipodes is equipped for around-the-world cruising and is a perfect choice for the liveaboard cruiser. 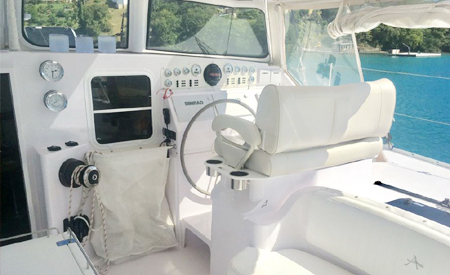 Where will you go next aboard s/v Antipodes? 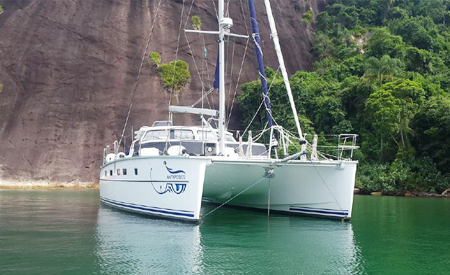 "When the time came to sell my Antares 44i Antipodes, my first and only broker of choice was Rhumb Line Yacht Sales. Their thorough knowledge of the Antares and their strong relationships with the owner’s group and the factory ensured that they would best represent my yacht. Beth and Ross have been very responsive to all my questions, and their outstanding support and service is truly impressive. In my absence they have coordinated any work required on my yacht, including managing the installation of new Volvo engines by moving Antipodes to the yard and back, and making sure all the work was done properly. There really isn’t anyone else out there that I would wholeheartedly trust to care for my yacht. I know that I can rely on them for the best possible advice and am positive that whoever buys Antipodes will benefit greatly from their service."